1) Make homemade cherry limeade! Pit a bunch of cherries (10-20), and put them in a wide-mouthed pitcher or jar. Muddle (i.e., smash up) the cherries with something (the back of a ladle, a thin rolling pin, whatever you have around). Add some sugar, the juice of 2-3 limes, and sparkling lime-flavored water. Stir madly. Taste; adjust sugar and lime. Stir again. Add ice, serve, drink, and say ahhhhhhhhhhhh. For raspberry lemonade, do the same as above except use raspberries and lemons. Strawberries will work, too! For the adults, add gin or vodka and get ready to enjoy the most refreshing and relaxing summer cocktail you’ve ever tasted!! 2) Have a lemonade stand! My sweet friend Katie and her two daughters inspired me to do this. Thank you Katie! Watching the kids get everything ready and then serve their little customers is absolutely adorbs!! All you need is lemonade (see above! ), plastic cups, ice, a ladle, a table and tablecloth, a sign, and something to keep your money in. Join up with your neighbors for even more fun! 3) Organize your junk drawer. You know the one. Get a few organizing trays from T.J. Maxx or Target, and go to town. You’ll be so happy when it’s done. Plus, you can actually find things when you need them! 4) Freeze animals and then “free” them! This is my favorite kid activity of the summer! Put some small plastic animals (or other objects such as plastic jewels, dinosaurs, beads, coins) in a few shallow tubs of water. Place the tubs in the freezer. The next day, get out the tubs, pop out the block of ice and set them outside. Let your kids “free” the animals by breaking the ice with various tools (rocks work well). This is perfect for ages 3 and up — and will keep them busy and cool for hours! Just put a few bags of tea in a jar of water. Set in the sun and let the bags steep! Use decaf or herbal tea for kids (hibiscus or hibiscus mint are delicious and bright pink, too! ), and stir in a little honey for a sweeter flavor. 6) Brighten up a room! For example, add some color to an indoor or outdoor space with a bright new rug. I got one from World Market for our kitchen and I adore it. The color is beautiful, it was reasonably priced and is excellent quality. Every time I see it, I smile! Even in the summer, my skin gets dry in certain places, especially after a few hours in the sun and chlorine. For my face, I am LOVING this Clinique Moisture Surge gel-creme. The description on the box says: “Rapid long-lasting hydration in a refreshing oil-free gel. Delivers a burst of moisture. Smooths, softens. Locks in moisture all day.” Yes please! 8) Make crab cakes for dinner! Even if you’re not at the beach, close your eyes for a few minutes and imagine that you are … crab cakes will take you there! Serve with a crisp Sauvignon Blanc or Vino Verde. No kneading or bread maker required! Your house will smell uh-mazing while it is baking … then serve the warm bread with the crab cakes (above), or have a light dinner of bread, cheese, olives, cured meats and wine. The next morning, if there is any left over, make French toast for breakfast. 10) Make a GIGANTIC banana split for dessert. Give everyone spoons and dive in! 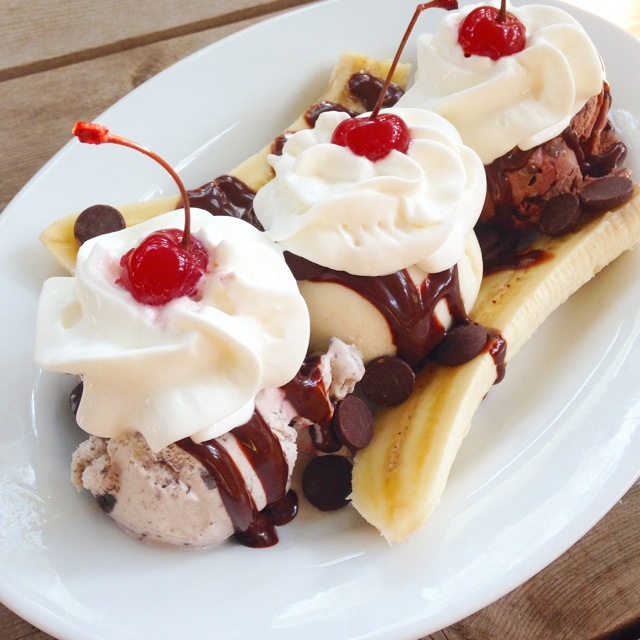 A banana split with three scoops of ice cream, whipped cream, cherries, chocolate syrup, and chocolate chips isn’t just a dessert, it’s an experience. Savor every bit!